The city that started the American Revolution is proving its strength by simply moving forward. NBC’s Katie Tur reports. >>> finally tonight, a city living up to its new rallying cry -- boston strong. it was seen and heard all over boston today as the city emerged from one of its darkest chapters. nbc's katie terr has more tonight. >> reporter: sunday in boston , faneuil hall is filled with music. >> reporter: newbury street lined with shoppers and boston common only do days ago deserted is now filled with children. >> it felt like an infusion of 60,000 people came in overnight. >> reporter: the city that started the american revolution proving its strength by simply moving forward. >> you don't mess with boston . it is a very, very resilient town. people here -- life will go on. >> reporter: judy and susan, both nurses, came to the edge of boylston street came to lay flowers. >> i know what the injuries were and i hahad to come down and see it for myself. >> reporter: in boston the big signs of support have been just as important as little ones. free hugs on boylston street . >> yeah, boston -- woo! >> reporter: memorials both temporary and permanent. >> see how great the community is getting behind you girls? >> reporter: sim gal gestures surpassing the wildest expectations. these girls baked brownies well past their bed times to raise money for people they never met -- the family of 8-year-old martin richard. so far they raised $5,000. 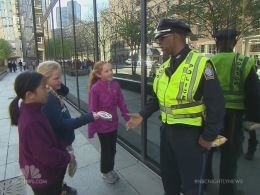 today they delivered cookies to boston 's finest. sglits's great that they helped and i really wanted to thank them. >> reporter: boston strong, wicked strong, we are one boston . >> feel like a firefighter i'm getting so much love. all right? >> this is boston . my home. i'll never turn my back on it. you know? >> reporter: katie terr, nbc news, boston .